Debashish Bhattacharya Our Guru of the school - a successful artiste, composer, teacher, performer - a complete musician, has a cherished dream. His ultimate goal is to send the message of universal music in every nook and corner of this global village. 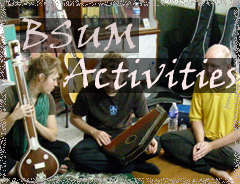 The International school of music (BSUM) is the institution which worked towards achieving his goal for ten years constantly on each residing student and brought the genuine success in Guru- Shishya Parampara ( Guru Disciple tradition ) in the field of Indian classical guitar as well as in the world of slide guitar. During his early days Guruji always felt there was absence of a disciplined training and syllabus, which is specially written for the training of Indian classical Guitar and slide guitar in general. Recognizing the abundance of talent in India and all over the world, he has written a syllabus, the first of its kind, on Indian Classical Guitar/Slide guitar. The syllabus has six grades. 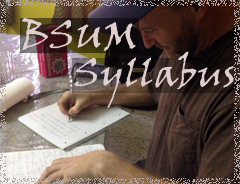 The success of this syllabus has already been demonstrated by many of his performing students. Three of them have received National Scholarships of Music and three others, as 'A' grade artistes of Prasar Bharati, are performing classical Guitar from different parts of India. One of them has won a national music competition award. Students from abroad have achieved and have been recognized as better musicians skillful and successful in career. The past ten years of our school training system and day to day grooming has brought a new generation of slide guitarists around India and the world. Guruji also provides stage opportunities to the groomed talented young musicians through his Music Club Mehfil-e-Muzik and Navodit Kalakar Sammelan which is being funded by the Non profit school. It is devoted to propagate the true essence of Indian Classical Music. 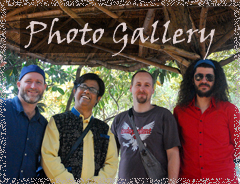 There is a constant flow of students from abroad who are staying in Kolkata for a stipulated period of time with their Guru and his family learning Guitar, Vocal, tabla, sitar and various other instruments. A special music-training course has been implemented with emphasis on building up musical consciousness, working towards better living through practice of Raga and kindling awareness about the spirituality, divinity and joy of being with the day to day practice of music. The high quality training evolved by Guruji- Debashish Bhattacharya for the benefit of the universal musical society is showing encouraging results now. Rooted on the firm ground of age-old tradition, it has embraced the present generation in its loving fold to work for musically enriched future.